Daniel Gruszka is the 22K time trial record holder! Come out and prove it and set a new course record! The original 15K Time Trial course record was set by Jamie Bowen, 7/7/2013 with a time of :22:27. The Smith Multisport 2019, 22K Time Trial schedule is up. Get on your bikes, train and get ready to race. for both "races of truth". Teams can be all male, female or coed. The team finish time will be the last team member across the finish line. The winning team prize for the Team Time Trial is sponsored by Orrie McCrae. President of the Okefenokee Track and Cycling Club. set of bicycle safety lights! 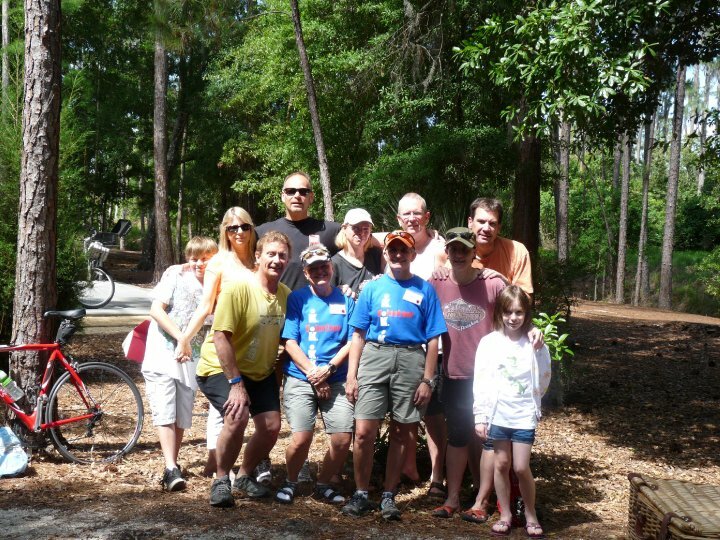 The RAAM Cycling Challenge Daytona, 11/10/12, was a great event. (Race Across AMerica) There was a 200 and 400 mile unsupported race and a 120 mile Gran Fondo supported ride as well (the 400 mile race was a RAAM qualifier). I couldn't find a support crew (driver for my truck) for the 200 mile race so happily rode the 120 miler. Put this on your calender for next year. Epic day on the Kona Coast and the IM Honu. can be more difficult there too. I raced to my fitness on a beautiful but difficult course under more difficult than normal conditions. My training for this course was close to my full Ironman training. I needed every minute of it. I finished. And now I know how to help you finish it too. The new HITS Triathlon series is having a great start. I participated in the Naples, Fla half Ironman last January 13, 2012 for my season opener. And Naples is warm in early January! So if you're looking for your 1st Sprint triathlon to even Ironman, HITS has the distance for you, every month across the US. They even have a FREE, short, "Open" tri so you can see what it's all about. "Eat to train.... don't train to eat"
* How do you measure your level of success? * Time Trial info and results. Race report for the 2010 Georgia Veterans' Triathlon on the blog. Allen's Race report: Florida Ironman 70.3, May 16th, 2010, Walt Disney World, Fort Wilderness, Florida. I finished and have the medal! It was HOT... as it always is. I've done this race 3 times and it's a very consistent venue. We were fortunate to have gotten a campsite at Ft Wilderness and it was only a short walk to Transition from our camper. We also hosted a pancake breakfast at our campsite Saturday morning for our Ironman buds that were in attendance, some from as far away as Canada and Minnesota. Fun!!! Race day. Warm water in Bay Lake. The temperature was over 80 degrees, so no wetsuits were allowed. Pretty uneventful. I swam away from the buoy line so I wouldn't be swam over by the very fast swimmers in the waves following mine. It made for a little longer swim but no worries... I planned to pass them on the bike. The bike course is hilly and warm, and often wet from Central Florida showers. The course goes into Lake County... the home of Sugar Loaf Mountain and the infamous Great Floridian Triathlon. My bike computer was DNFunctioning. I stopped after a couple of miles to work on it and decided... why? I was being timed, so I better get rollin'. There are no time outs... part of race day. I went solely on RPE (rate of perceived exertion) and finished with a 17.1 mile per hour average for 56 hilly miles without really knowing how far or how fast I was going. IM OK with it. The run is affectionately known by us Ironman regulars to this venue as "The Ditch Run". 2 miles of the 4.5 mile loop of the three loops course are on a grassy service road, bordered by a gator-filled ditch. It ain't the "Happiest Celebration on Earth," let me tell yah. Numerous young, fit athletes were doing the run/walk. So was I. I started running five minutes then walking for one minute, then went to a 3 minute run and 3 minute walk. I managed to still have a :30:00 plus faster run split than an IM friend that had a 19+ bike average. But he toasted me on the swim and finished :05 ahead of me. This is what makes triathlon so fun... "it ain't over til it's over". Overall... a good day! IM alive and well and blessed with fitness to even do this stuff! I drove over from home and Robert Preston drove over from Douglas. 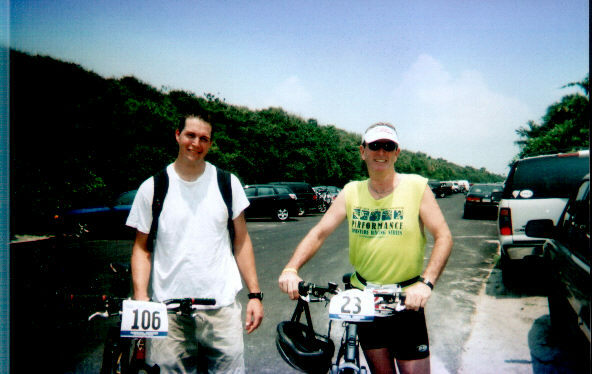 Robert is a friend and fellow Ironman triathlete (having lost his IM virginity at the now gone, Duke University Blue Devil). We finally got tired of waiting and decided, since we both had driven nearly an hour to get there, we may as well ride. So we mounted up and took off. Chatting at 1st and then dropping into the aero bars for a NO drafting, 20 miles in 1:05. It was a beatiful afternoon with temps in the 80s (after a thunder storm) and overcast over really pretty countryside. So.. what seemed like a waste of time turned into a great workout in a beautiful place with a good friend. So... always make the best of what seems like a loss and "Never give up!" Copyright 2010 Smith MultiSport. All rights reserved.